The string of strikeouts was cool and all, but there's still no margin for Moyer to walk batters, be squeezed by an umpire, or have lousy defense behind him. None. And unfortunately, tonight, he walked batters, got squeezed a couple times, and had a couple more misplays behind him that added urgency to pitches in the 3rd and 4th. All of those extra baserunners, pitches and the stress added up to 100 pitches in less than four innings. 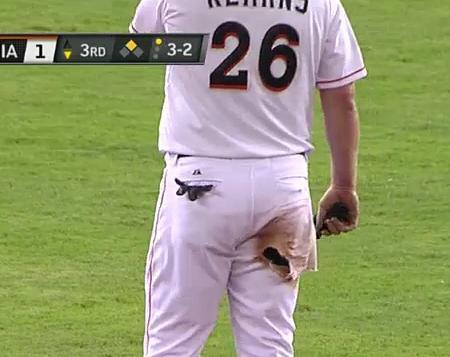 Not all his fault, of course, but quality pitchers work around those messes from time-to-time. Moyer can't. Moyer needs everything to set up perfectly or it's going to ultimately end up with these results. 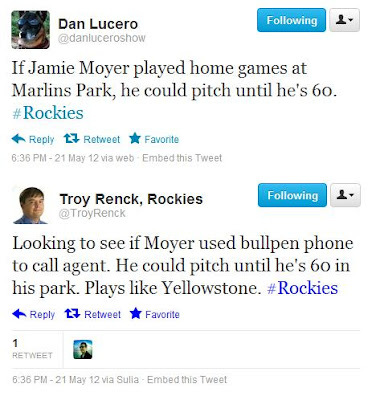 That said, the Rockies don't have much choice but to stick with Moyer. I understand. Options are a bit limited right now. But I've seen more than enough of the downside to know he's the next guy that deserves to go when Jorge De La Rosa gets healthy or they're ready to promote Drew Pomeranz again. It's been a nice story. Kinda cool to see him achieve a couple historic things in a Rockies uniform. It's just getting to be time to start looking at someone who can help in 2013. The most awkward screengrab I'll take all season. What's Next: Game 2 in Miami comes your way on Tuesday with another 5:10 first pitch. And I can tell you the Juan Nicasio-Ricky Nolasco will take place this time. I guarantee it. Final Thoughts: This excerpt from Dave Krieger's Sunday blog post made me laugh. "There's no Lombardi speech you can give," said veteran Jason Giambi. "We've just got to try to win one game and make it that simple. I mean, we can't play any worse than we have. We need to pick it up and win tomorrow. And then win the next day. I think we can't get ahead of ourselves." "Obviously, we're in a rut, and we have to dig ourselves out," he said. "That's what we have to do. We've got 122 chances to do it." Boy have I got bad news for Jim Tracy. 122 chances (now 121)? How delusional is this guy? It's more like 20-22 chances if you want to be reasonable (or logical) about it. I say that because on June 15, the Rockies begin a nine-game road trip through Detroit, Philadelphia and Texas. If they can't make SIGNIFICANT headway by that date (and they won't), they're going to be so completely buried come July 1 that my prediction of 78 wins is going to start looking absurdly high. Not that it doesn't already. So no, genius, you don't have 121 chances to turn it around. It's more like you only have 121 more chances to manage the Colorado Rockies... and in the big leagues for that matter.